I read your interesting article, “River in the Desert, Fresh or Salt Water?” in the May 2018 issue of P&S magazine. I was surprised to read about plans for a major joint-venture project between Israel, Jordan, Syria and Palestine. It is good to hear that these countries (are working) together. Assuming that the given pump flow rate and head values are close to best efficiency point (BEP) operation, a couple of different scenarios were run with the efficiency calculator. 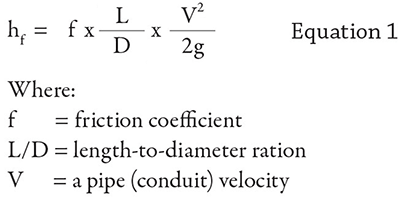 For each pump: 1.0 m3/s flow rate ≈ 15,000 gallons per minute (gpm), 2 meters (m) head ≈ 6 feet (ft), from the article pages 14 and 16 power calculations, specific gravity used = 1.00. At 200 revolutions per minute (rpm), calculated efficiency ≈ 84.7 percent, input brake horsepower (BHP) ≈ 26.8 horsepower (≈ 7 percent into 15 percent service factor of a 25-hp motor). For each pump: 1.0 m3/s flow rate = 15,850 gpm, 2 m head = 6.56 ft, Mediterranean Sea water specific gravity ≈ 1.03. At 200 rpm, calculated efficiency ≈ 85.1 percent, input BHP ≈ 31.8 hp (≈ 12 percent over 15 percent service factor of a 25-hp motor). In regard to the saltwater option shown in Image 1, on page 14, what is the purpose of the return tank? I may have missed a mention of this tank in the article. 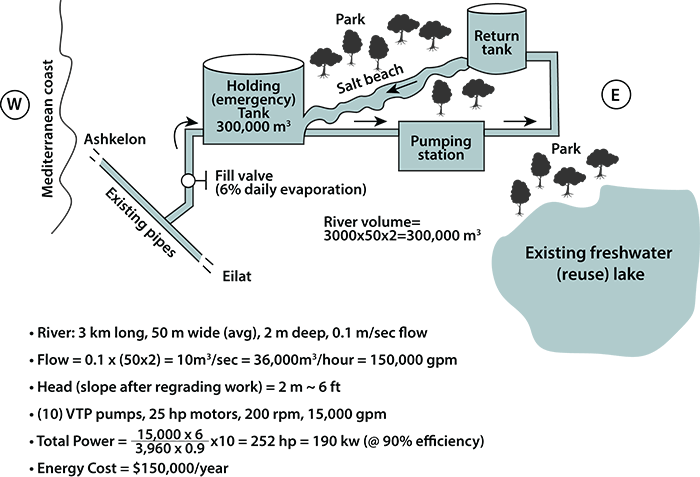 Will the ~6-foot pump head be sufficient to move water to the upper end of the river in addition to overcoming friction losses through 3-kilometer (km) of suction/discharge piping? Pump and motor selections could be affected. Thank you, Lee. There were several others asking the same question, so I am glad this is helpful to the U.S. engineering community. The western part of the U.S. has similar challenges regarding water, as the desert landscape of much of that area is somewhat similar to Israel, especially southern Israel. These initiatives that started several years ago in Israel are good examples of how logistics and engineering can work together well to make dreams become a reality. Obviously, any big idea has challenges and issues to overcome—and many people, disciplines and opinions need to be balanced and heard to find a good optimum solution. Often, modifications to the original proposals will be updated, modified and evolved into something real and tangible. Just as you are, many others in the U.S. are not usually aware of many good and major engineering initiatives that are going on in Israel. Those include a Dead Sea project (as mentioned in the article), Lake-and-River project in Beer Sheva, Israeli water infrastructure, desalinization work to save the Kineret and many others. Images 2. Modeling test rig, initial layout. By educating the technical engineering community in the U.S., we can all help bring other important innovations to life. We already received interest also from the business community in the U.S. asking if the “River Project” is looking for investors, which I am sure would be good information for those interested, beyond just engineering aspects. After all, everybody drinks water! Images 3. A multidisciplinary team. We plan to construct a scaled down model of the “River in the Desert” project in our laboratory at Sami Shamoon R&D Pump Center in Beer Sheva, and would like to invite readers to continue to come up with the ideas and input, just like Lee Ruiz did. One of the things we are planning to evaluate is the efficiency and energy consumption of these pumps via theoretical calculations and live testing. The way to further reduce the cost of energy required to “circulate the river” is to add a hydraulic turbine to recover the water energy, which should reduce overall energy cost substantially. If that can be done, then the cost of ground removal and major excavations to reduce the total existing elevation from 70 m to just 2 m would not be as important because the energy will be mostly recovered. The more work the pumps would do, the more energy will be available to take it “on the way back.” In the U.S., hydraulic recovery turbines became very popular in the early 1980s, and I used to design hydraulics of such turbines in those days, so I guess history comes to repeat itself! Thank you also for correcting my initially “guessed” pumps efficiency, which you adjusted from my initial 90 percent value to about 85 percent, which makes the energy cost go slightly higher. The pumps motors would also be increased in power a little. This is a good illustration of how the design process works—starting from a concept and undergoing several stages of adjustment and refinements.